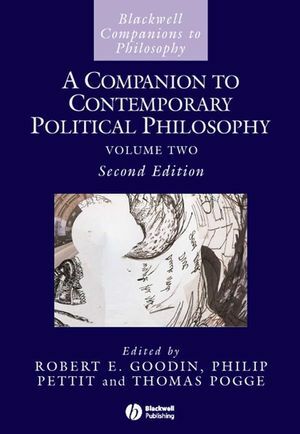 This new edition of A Companion to Contemporary Political Philosophy has been extended significantly to include 55 chapters across two volumes written by some of today's most distinguished scholars. Robert E. Goodin is a Distinguished Professor jointly of Philosophy and of Social & Political Theory in the Research School of Social Sciences and a Corresponding Fellow of the British Academy. General Editor of a 10-volume series of Oxford Handbooks of Political Science and founding editor of Blackwell’s Journal of Political Philosophy, Goodin served as co-editor of the British Journal of Political Science and Associate Editor of Ethics. Philip Pettit, formerly of the Australian National University, is now L.S. Rockefeller University Professor of Politics and Human Values at Princeton University. He works in moral and political theory and on background issues in philosophical psychology and social ontology. Thomas Pogge is Professor of Political Science at Columbia University and Professorial Fellow at the ANU Centre for Applied Philosophy and Public Ethics. He is editor for social and political philosophy for the Stanford Encyclopedia of Philosophy and a member of the Norwegian Academy of Science.